A cleaner, more simplified version of my site should be posted tomorrow. My old college friend, who is a master site builder, worked on it. His name's Ryan Anderson (see his site at ryanworksathome.com). I'm already thinking about all the stuff I'd like to add to it. More variations of the kind of work I want to show and the variety of media I've played with. Tomorrow is also the Illustrator's Conference hosted by the SCBWI at the Society of Illustrators in Manhattan. It's always a nice intimate event. I hope to garner lots of interest from art directors, buyers and editors from my updated portfolio and site. In the meantime, because of all the time I'm taking to prepare, my dog's not really happy. He's all stinky and feeling neglected and desperately wants to play. Poor thing. Because of my working late nights, my mornings are pretty slow going and so is the dog. 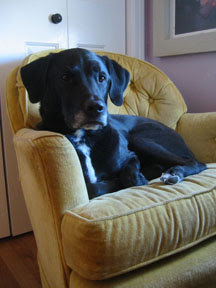 He sits in his favorite chair which I purchased from a 2nd hand store for $25. It's located in my studio right next to the window. Very comfy.